KCM Group Blog | KCM Group is a support organization dedicated to artists. This memory is emblazoned in the minds of every American; we call it 9-11. The twin towers in NYC were destroyed and we watched it on live TV. My painting is an angry setting sun over New York, the towers white as ghosts, our memories seared. A print of it joined the 9-11 Traveling Show that toured America. I believe we still struggle to make sense of it. Prints/mugs/tote bags, etc. can be purchased at https://fineartamerica.com/profiles/kc-moore.html until September 20th. Several years ago, I retired from the gallery scene because we were planning to move out of state. It was with a heavy heart that I boxed and inventoried my paintings. As it turned out, we didn’t move but with everything boxed I did not paint for several more years. Returning to the easel was actually painful and slow plus it lacked passion. Even recently I felt I was lacking until the Other Door Opened. Just last week I discovered a website that will allow me to post my paintings and let others buy prints. In addition to that, those images can be purchased on books, tote bags, cups, pillows and many other ways. In fact, I bought myself an 18” x 18” tote bag (featured image above) and a notebook for a friend’s birthday. I think it is important to have an outlet for art and this is much easier than bringing original work to galleries. Each month I will post 25 images out of the hundreds of the pieces I’ve produced over the last two decades. This site is the largest in the world of its kind and on my first day, 40 people found me! Today I invite you to check out this site and see my first 25. It is exciting to have this new venue that reaches world-wide. To see my work simply search FineArtAmerica.com and search for KC Moore. Thanks for joining the next phase of the journey! Tom Cameron is an accomplished, award-winning photographer. His talent has grown over the last 15 years as he explores the world behind the lens. At this point he has nearly a dozen solo exhibitions in his resume and been published in numerous places including The Windsor Historical Society. I’ve noticed the progressive stages in his work over the years and he is now delving into new and somewhat ephemeral images. His passion most certainly involves the water, often on the water in a kayak. His specialty is early morning when the dawn’s low angle lighting provides quiet emotions or misty scenes. As he states “My photography is predominantly realist, organic, non-composed imagery. I concentrate on waterscapes and their flora and fauna with occasional still life and abstract works.” He colorfully uses the concept of *macchia to describe his approach for this collection. Surfaces contrasts the realist with the more distracted images found in the environment perhaps reflecting the variable movement and lighting effects. *Macchia: Italian artist Vittorio Imbriana defined the concept as the instantaneous recognition of a total compositional effect. A Whale of a Show, Larry Carnes is Back in Town! This is Larry Carnes’ transition show. He has relocated to Northern California but will be showing ~40 pieces of sculpture and pottery in Sacramento. The inspiration for this group started with a dream about making a big whale and having a herd of horses on its back. It began with 3 or 4 and then a few more and then new ideas for shapes of whales developed. The largest of the whales is approximately 34” in length. In addition to new concepts, Larry is featuring new glazes in variations turquoise and white with texture from smooth to rough. A master in clay work, he contends that mica is the primary ingredient and provides a rough surface texture. This show will also include some of his work with native Chumash symbols, some figurative pieces, and Toucan bowls. Altogether the show will encompass some traditional and some brand new ideas. Brian Tanner will host this show at Alpha Fired Art Gallery from April 21th – June 2nd. After talking with Tom Thompson, current president of NCA and several others, I rediscovered a gem in the midst of our Sacramento arts community. It was a grass-roots movement begun over 75 years ago. It was started by Harold Morse Ward (‘Morse Code’ family) in 1939. 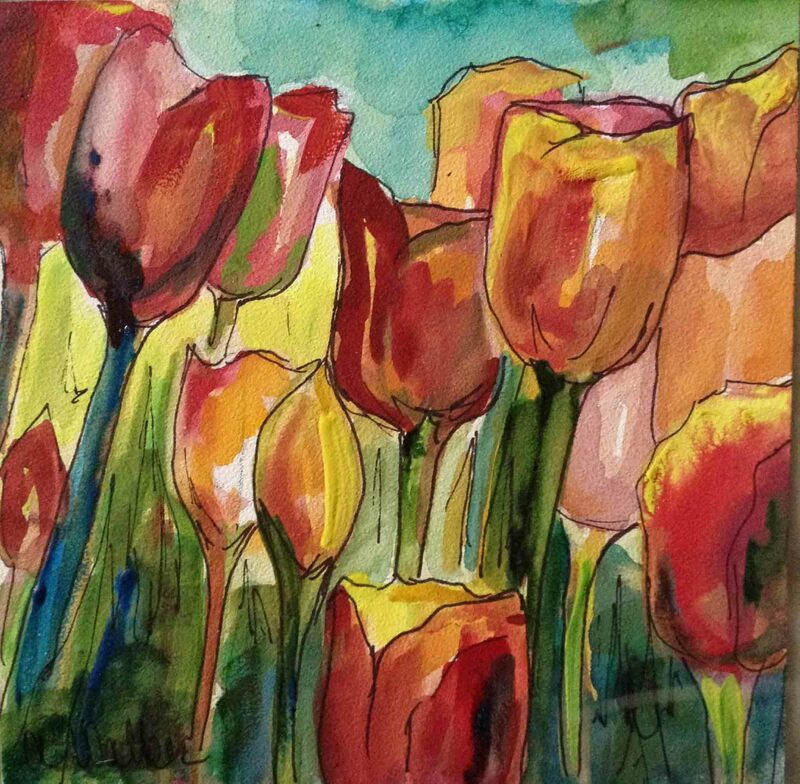 This month they hosted an International Show entitled “Bold Expressions” juried by Margot Schulzke of Auburn , CA. 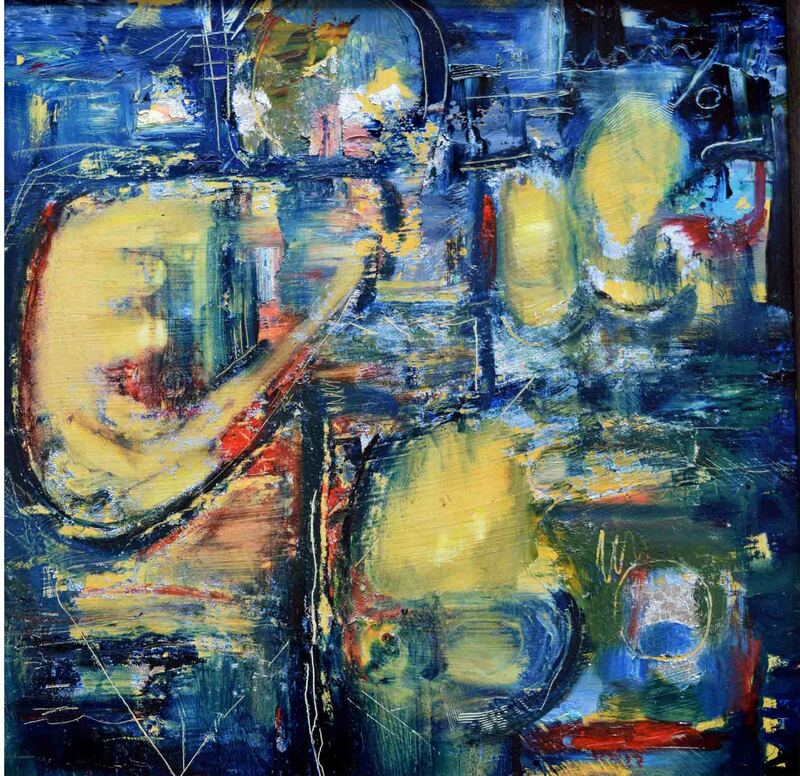 She is a renowned artist in Europe and America. The competition was stiff as only 30% of the entries were accepted. Posters express the some of the organizational statements including “Supporting Cultural Life” and “Encouraging All Artists”. This organization was developed by artists, for artists, it survives to this day run by volunteers who believe in the vision. Today the NSA is housed in the Fine Arts Center in Carmichael, CA. Located at 5330 Gibbons Ave in Carmichael, CA. Hours of operation are 11 am – 3 pm Wed through Sat and for special occasions. Robert Alan Smith was a career artist spanning 6 decades. When an artist passes away, his estate has to choose how to administer the legacy that remains. We have received numerous emails with questions about his work. Now we can more easily offer information to the public. RA Smith died in 2008 and the estate has diligently worked to compile and catalogue the art, historical documents, photographs, etc. Finally, we have developed a website where we can offer first source information and a method of communicating directly with the estate. It is just a start. We will continue to add documentation, photos, art and stories so this will provide the best information available. We would also want to know the type of information the public desires: Perhaps personal stories? Insight into his process? Feel free to contact us with your requests and we will accommodate as many as possible. He trained and later taught at Chouinard Art Institute. He also trained under Sequeiros. 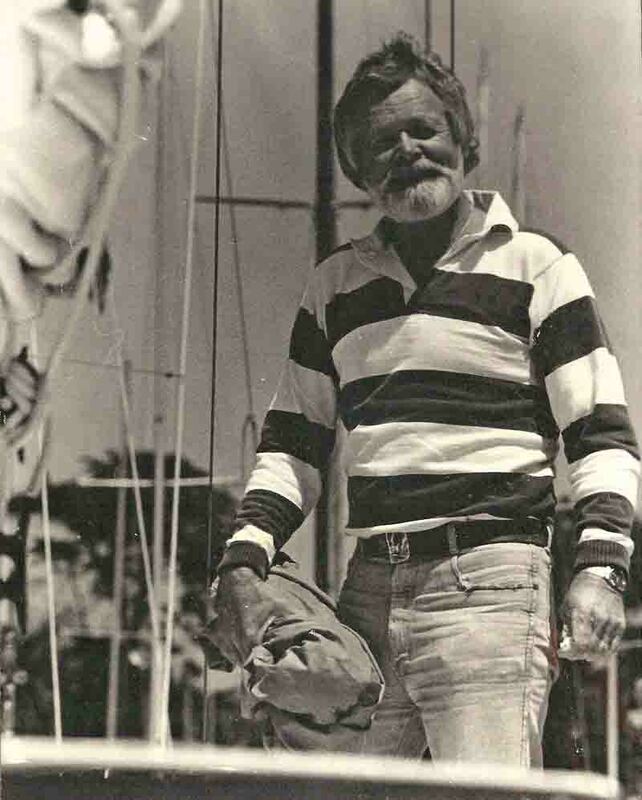 He lived aboard a sailboat in Ventura while painting a sold-out series of very large oil paintings (insert on right). How did that work? He lived in Ojai, CA during his serigraph period; he built his own process. This man’s life was both accomplished and fascinating. This easily could be a movie or book in the making. Please join us as the journey has just begun. It was the meeting of friends; to view a show which Dianne participated….but it was much more! She had mentioned it a few weeks back and I had been on travel but I wanted to see it. It was pushed smack into the middle of the very next day. I am so glad I took the time. 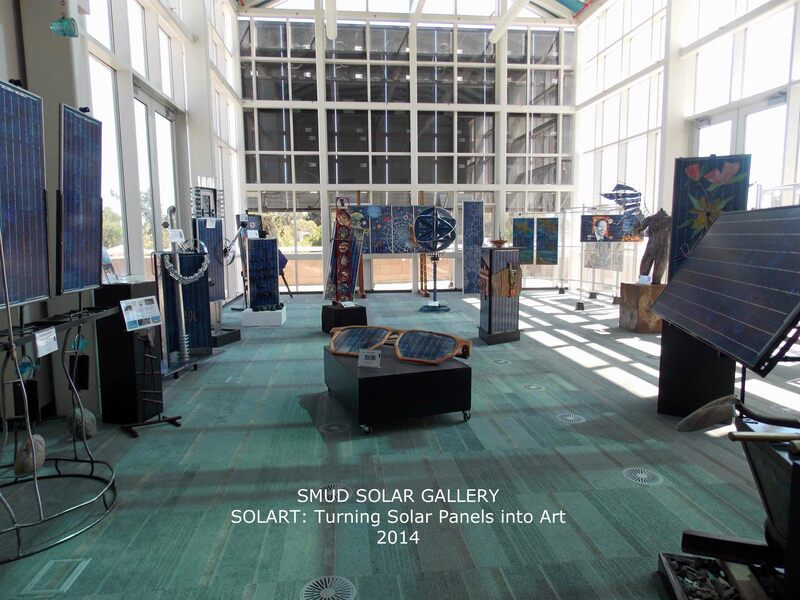 The show is entitled: SOLART: Turning solar panels into art. It is sponsored by SMUD, Valley Sculpture Artists and Sacramento Metropolitan Arts Commission. They made a call to artists to turn 100 ‘historic’ (used in Sacramento homes) solar panels into art. Twenty-five local artists answered the call. Each used their superior talent to morph these 20” x 43” blue, crystal-like glass panels into something beautiful and interesting. Their themes include classical mythology, statements about past, future and renewable energy, natural resources, progress and more. They enshrined these panels with stone, shells, ceramic, wood, metal, fabric and many other unique embellishments to produce a totally unique WOW factor. This is inventive, intelligent, thought-provoking art. 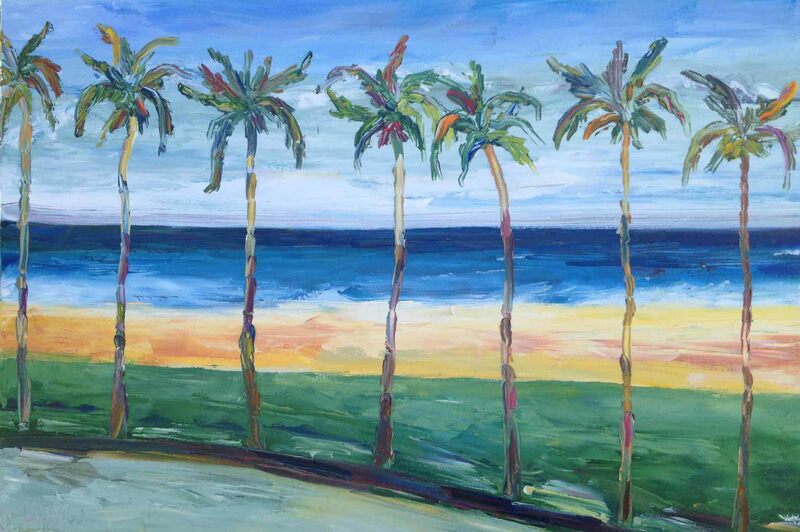 My friend Dianne’s diptych entitled ‘Evening Paradise’ featured her signature palm trees. She said they “represent resiliency through the storms of life.” Many of the pieces are large and wonderful to walk through and touch. To view the show, park across from the SMUD Customer Service Center located at 6301 S street, Sacramento, CA. 8 am – 6 pm M-F. While there are some installments in the 1st floor lobby, take the elevator (look right) to the 2nd floor Solar Gallery to experience the majority of the work. Show ends July 31st – if you are in Sacramento, It is worth the effort to take in this show. 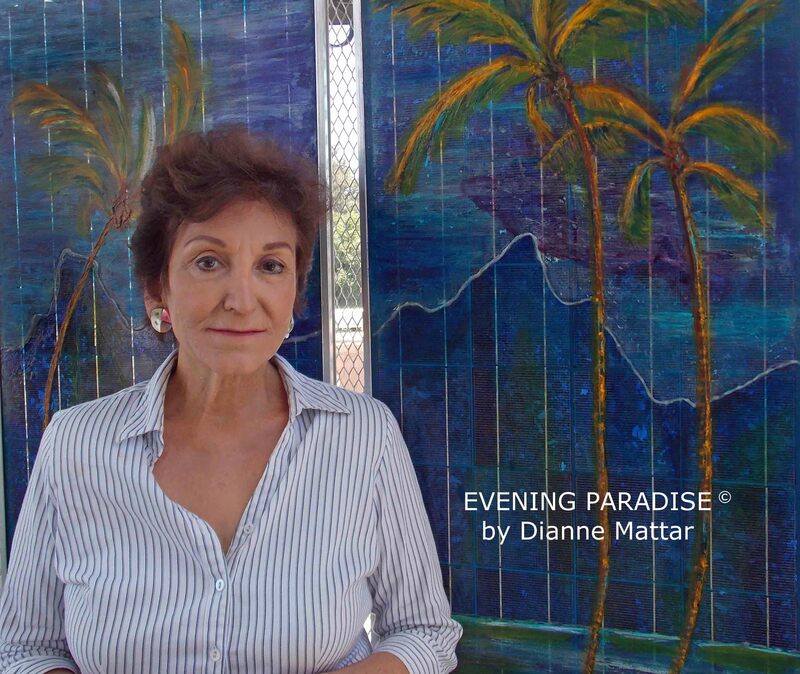 Write Dianne Mattar at: artistmattar@gmail.com for more information. It was this lady who taught me to set up my first pallet and she has taught many, many successful artist in our region over the years. 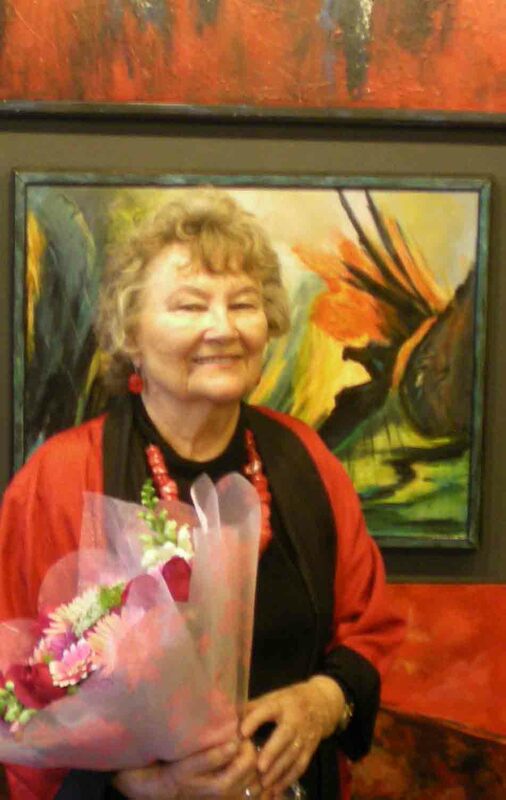 As an artist she has explored virtually every medium imaginable. A quick survey of her studio/classroom reveals the trappings of a true, passionate artist: work on wood, canvas, paper, glitter, nails, dozens of award ribbons, crystal, angels, shells, pearls decorating cloth, flowers, tiles, homemade paper, antiques, stained glass, fur from a bison, numerous drawers stocked with stuff to form new works of art, and innumerable other things of interest. I audited a class in her private studio to interview her for this blog. Some of the statements I heard included “We have to create the feeling first” to one student and “I want you to learn trees” to another. That particular statement triggered a memory of my first lesson where she took the whole class outside to ‘see’. To see how everything reflected on everything else. How the standing water reflected not only the sky but the paint color of the cars in the parking lot. I spent over a decade as a gallery artist and I owe it largely to this wonderful, talented lady, thank you very much Gretchen Ryan! 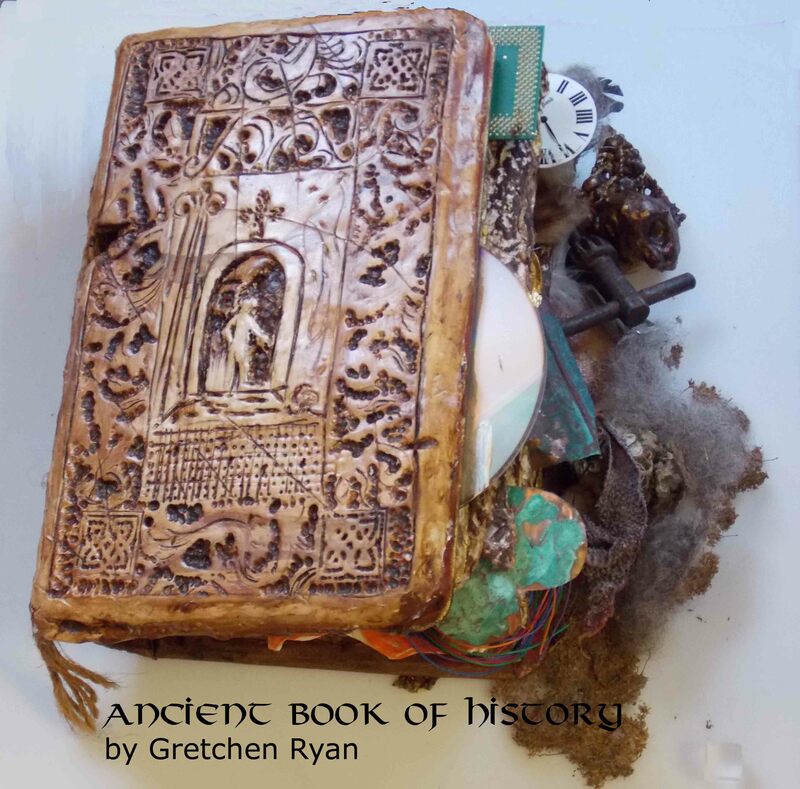 This will showcase her hand-made paper books. 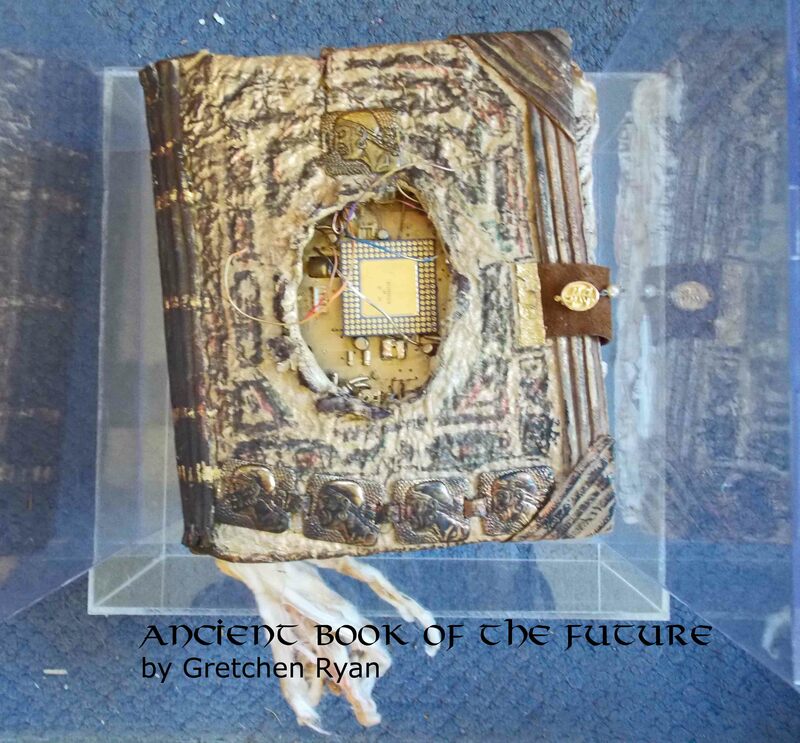 The names are intriguing: ‘Ancient Book of History’ and ‘Ancient Book of the Future’, neither is to be read or opened! By these books we can glimpse into the past and the future but we can really only know today! I’ve counted myself fortunate to know many master artists. I’ve written about several of them and other mid-career artists. As a different approach I want to introduce a brand new, never shown in a gallery art graduate. She participated in my Youth Invitational in High School. At that time she was inspired by her art teacher Matthew Buckley to pursue an art career. Now she sits at the threshold facing her difficult, wonderful future. It is now that the University of Life must instruct her and open up her path. She must “do the steps” in the words of a New York SoHo Gallery Owner on one of my treks. I saw her early work, it started with photorealism. During college it became heavy and loose. I predict these are but the start of the many stages of growth for this young artist. I’ve asked, “What does an artist need?” The art teacher says supplies, another artist says a mentor…..a new artist needs a chance. She will be a gallery artist soon but because I’ve watched her grow and develop, I want to be the first to introduce Alyse Walker. Welcome to the wonderful and crazy world of art!